If you do any kind of woodworking you probably have a mess of had tools already. They are either hanging on the wall, tucked in drawers, or hidden in toolboxes, and you probably have old hand me downs, new ones, and lots of duplicates! It's all good! ​I won't waste your time going over the usual stuff, like hammers, screwdrivers, chisels and the like. 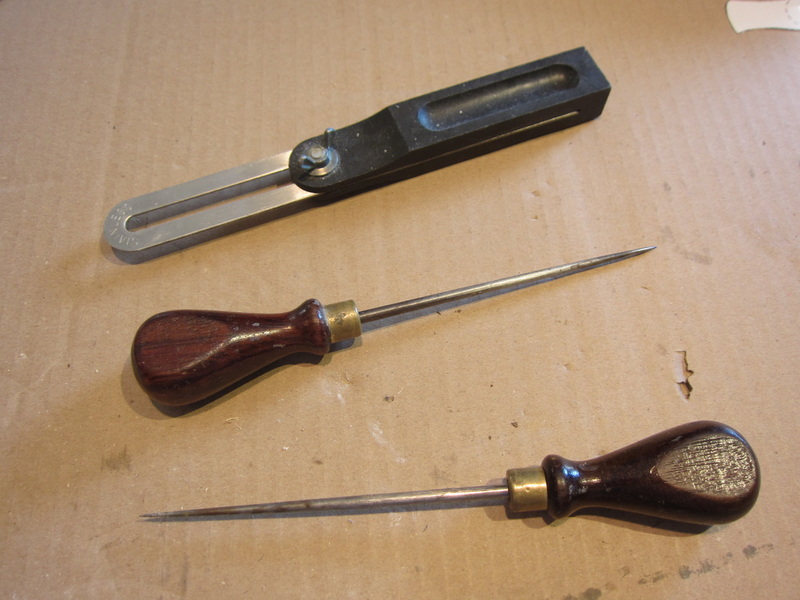 I will however highlight the unusual useful hand tools I use and those consider essential. If you have looked at the section on my assembly and work area you will see that I like to keep my hand tools close. As I also like a clear space to work from different sides, and lots of natural light the solution for me is drawers. This photo shows one of two large drawers open under my worktop. Since this photo I have added twelve more half- sized one an located this one under the one on the other side. I got tired of digging around in my large assortment for things I needed! Standing at the doorway looking in. Ok, so what's in the drawer! Number one is an awl. You cannot precise mark and drill holes without one, in fact get two. I have a couple just so one is always handy. If you down use one of these your falling yourself! Get yourself a broad collection of needle nose pliers, extra long ones, angled tips, small ones, smooth grip ones and serrated edge one for gripping. These are instrument for connecting links inside mechanisms and bending rods one fed through pivot holes. Get tweezers, yes tweezers. Buy on the set of assorted type, flat tip, pointed tip, reverse acting, extra long and short. You will find times will even needle nose pliers are to large. You won't bend wire with these but you can place things when gluing, slide tiny washers onto things, and picking up little pieces you dropped in the mechanism that are hard to reach. I find the reverse sprung ones especially useful for gluing things in place. Get small clamps. While I have same small metal clamps, I do not use them often. 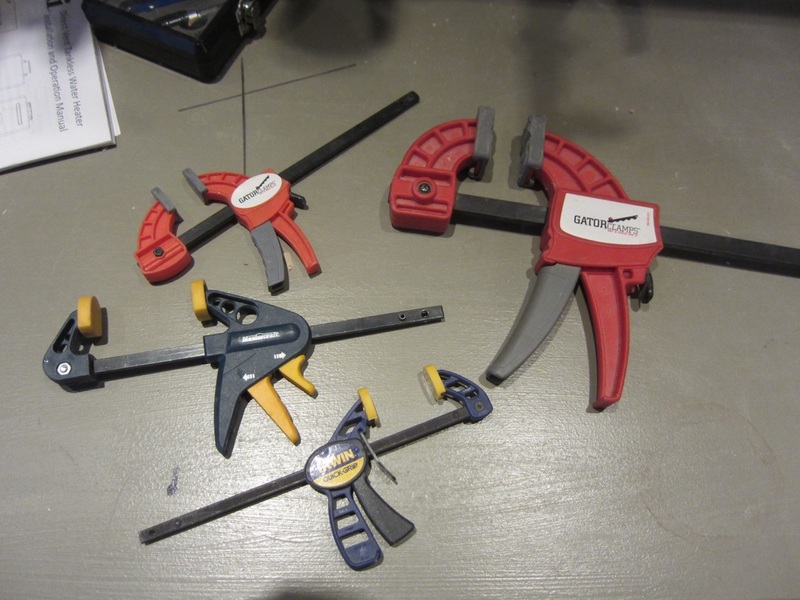 Usually small sliding bar clamps, (one brand is Gator Clamps) and spring clamps apply enough force for the scope of automat projects I undertake. There is a photo of some of these below. I most often use sliders from 18" down to 2" throat. Get a bunch. 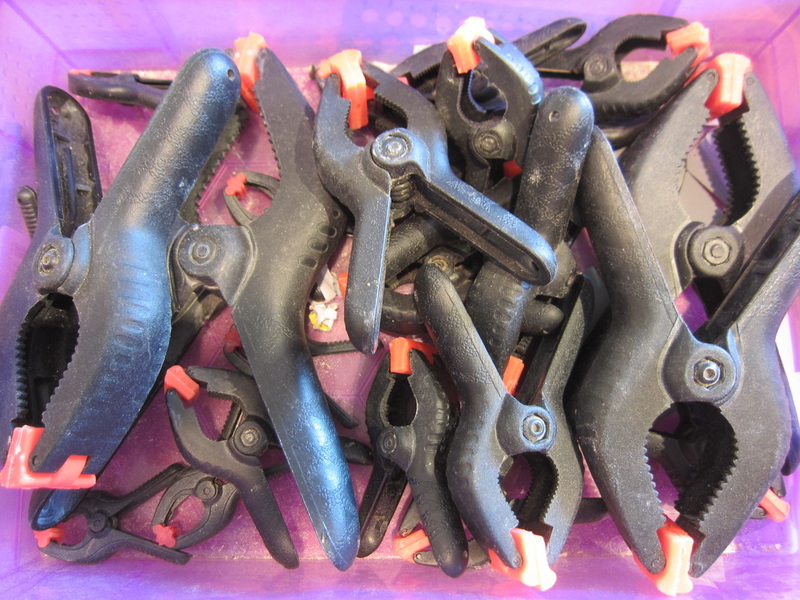 Also get a bunch of spring clamps, again, get a bunch and get a variety of sizes. If you're like me get a wad of pencils, I'm always misplacing them. I use .5mm lead mechanical pencils for a fine line. 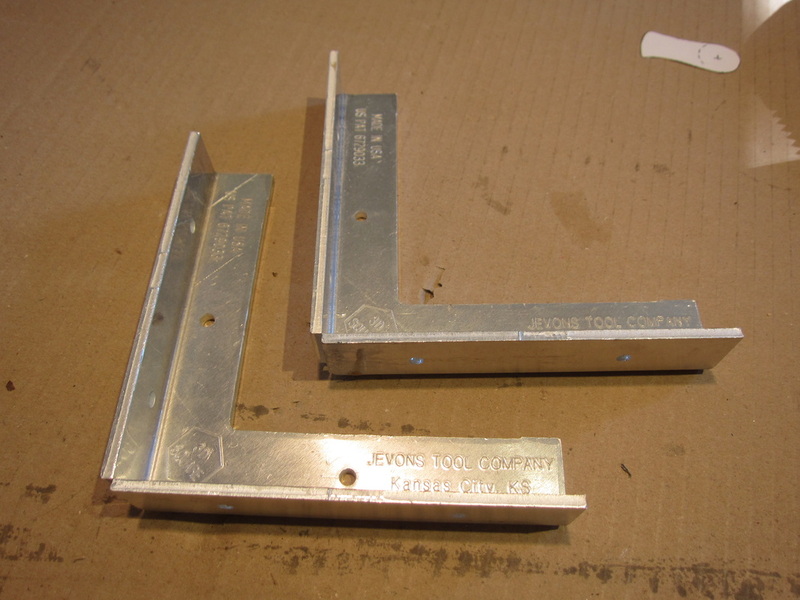 Get a sliding bevel for marking and reproducing angles when a protractor use won't do. Get lots of different profile small files, some to work with brass and some for wood. Saved my bacon many times after things have been assembled with these. Small files are usually available as sets of nine pieces or so. You need some small saws and a small miter box. See the section in Cutting for this. I do have a companion notebook computer that I do sometimes work in CAD on and take into the shop for short periods sometimes, but I can stick it in a drawer when woodworking and making dust. With a local WiFi network I can use the notebook to look up things in the shop and print them in the house for pickup.